This first book on this fascinating, interdisciplinary topic meets the much-felt need for an up-to-date overview of the field. 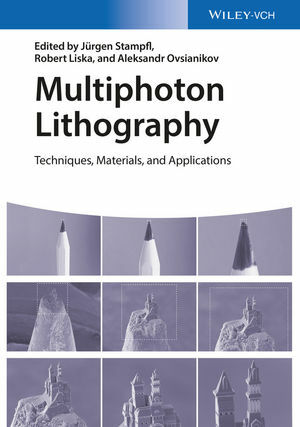 Written with both beginners and professionals in mind, this ready reference begins with an introductory section explaining the basics of the various multi-photon and photochemical processes together with a description of the equipment needed. A team of leading international experts provides the latest research results on such materials as new photoinitiators, hybrid photopolymers, and metallic carbon nanotube composites. They also cover promising applications and prospective trends, including photonic crystals, microfluidic devices, biological scaffolds, metamaterials, waveguides, and functionalized hydrogels. By bringing together the essentials for both industrial and academic researchers, this is an invaluable companion for materials scientists, polymer chemists, surface chemists, surface physicists, biophysicists, and medical scientists working with 3D micro- and nanostructures. Jürgen Stampfl studied Applied Physics at the University of Technology in Graz (Austria) and received his PhD in Materials Science from the University of Leoben (Austria) in 1996. From 1997 to 2000, he worked as a research associate at the Rapid Prototyping Lab at Stanford University (USA). In 2001, he joined the Institute of Materials Science and Technology at the Vienna University of Technology (Austria), where he was appointed associate professor for Materials Science in 2005. He is head of the working group Functional Non-Metals and since 2012 (together with Robert Liska) head of the Christian Doppler Laboratory for photopolymers in digital and restorative dentistry. His expertise lies in the field of additive manufacturing technologies and the development and characterization of advanced materials. Robert Liska received his PhD from the Vienna University of Technology (Austria) in 1998. In 2006, he completed his habilitation with a work on the topic of macromolecular chemistry. He is leader of the research group Photopolymerization at the Institute of Applied Synthetic Chemistry at the Vienna University of Technology. In 2012, he became head of the Christian Doppler Laboratory for photopolymers in digital and restorative dentistry and since 2016 he is full professor for organic technology. He is interested in the research topics photoinitiation, photopolymerization, additive manufacturing, and biomedical polymers. Liska is co-author of eight book chapters and of more than 100 peer-reviewed journal articles. Dr. Aleksandr Ovsianikov is currently an Assistant Professor at Vienna University of Technology (TU Wien, Austria). His research is dealing with the use of additive manufacturing technologies for tissue engineering and regeneration. Dr. Ovsianikov has background in laser physics and material processing with femtosecond lasers. After undergraduate studies at the Vilnius University (Lithuania) he completed his PhD at the Nanotechnology Department of the Laser Zentrum Hannover, and received his degree from the University of Hannover (Germany) in 2008. A particular focus of the current research of Dr. Ovsianikov is the development of multiphoton processing technologies for engineering biomimetic 3D cell culture matrices. In 2012 he was awarded a prestigious Starting Grant from the European Research Council (ERC) for a project aimed at this topic. Since 2004 Dr. Ovsianikov has contributed to over 60 publications in peer-reviewed journals and 5 book chapters.